Mum and daughter Jo and Lauren Parker graduate together. Most of the 800 graduands who marked the end of their uni years last month had picked their outfits well ahead of celebrations. Ulumburra Theatre was a sea of hairspray and mile-high heels. In comparison, Jo Parker’s family joked she looked like she was ducking out to the supermarket. But that’s because, unlike everyone else, she only had an hour’s notice she was to graduate that day. 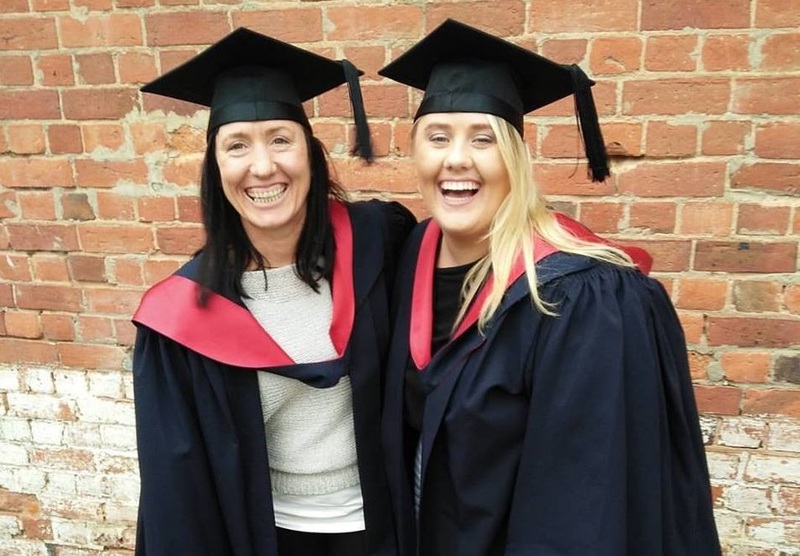 Although Jo’s graduation from a Bachelor of Public Health coincided with her daughter Lauren’s graduation from nursing, they didn’t plan to graduate together. An hour before the ceremony our Pro Vice-Chancellor Regional office heard Jo’s story, and gave her a call to say La Trobe wanted her to graduate with Lauren, at the university’s discretion. Jo made it to the theatre, in jeans and jumper, just in time to be gowned up. Jo enrolled in her degree after spending her working life in a variety of fields, none of them health related. She’s been a MYOB consultant, a trainer and assessor, a database designer, and owner of an Apple sales and service business. She says her family could “see the writing on the wall” for their IT business. In America Apple was consolidating its stores, and there was very limited margin in its products. So back to the books it was. Jo says she initially wanted to study dietetics and bio sciences, as she was interested in the idea of treating disease with high doses of minerals and had seen the impact this could have in relation to anxiety and mental health. She started with a common year to get back into study, where she earned herself an ATAR of 84. Her options for further study were wide open, but by that time Jo had found a real passion for public health. Jo’s experiences at La Trobe also helped when Lauren came to enrol on the back of a Diploma of Nursing at Bendigo Tafe. The eldest of Jo’s three daughters, Lauren had left school after Year 10 to complete Certificate Three in Community Services and Aged Care, and began working at just 16. “She was so capable at 16,” Jo said, adding Lauren’s pathway to university shows her tenacity and will to become a nurse. Lauren also picked up part time work in disability, which led to her completing another certificate, and then the diploma. After graduating from her degree this year Lauren now works at St Vincent’s Hospital in Melbourne. Jo is still currently on the job search, but in the meantime has been steadily applying her degree. She volunteers with Bendigo Community Health on a number of small research projects and has just completed a project with Australian Health Promotion Association on engaging Indigenous and Torres Strait Islander health promotion workers. While at uni Jo worked with other students to initiate the Healthy Together Kids Club, promoting good eating habits via the Bendigo Farmers Market. She also worked to develop a sexual health program for Radius clients and an anxiety and depression program for primary school children. Jo says the work of Public Health professionals can influence policy and practice, so while she won’t be at the coalface of health care, like daughter Lauren, her work will make a difference. “I can’t believe I’ll get paid to do this sort of work, I think it’s the best work ever,” she says.